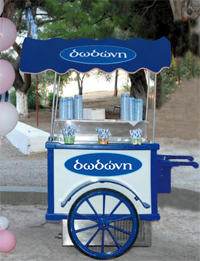 The retro gelateria as well as goods such as ice cream and disposables are handled solely by the company DODONI ICE CREAM SA and delivered to every specific event. The retro gelateria is necessarily accompanied by a responsible person of the company (girl, waiter) for the proper functioning of retro as well as monitoring the perfect organizing and service of products, and a driver or an assistant for that safest transportation when necessary. The cost of renting is formed according to the size of the event.